I have partnered with Flatout to create this recipe. I have been compensated for my time commitment to work with their product, however my opinions are entirely my own and I have not been paid to publish positive comments. I eat Flatout flatbreads for lunch and dinner all the time, but after trying these Maple Bacon Breakfast Wraps, I’ll be eating them for every meal! 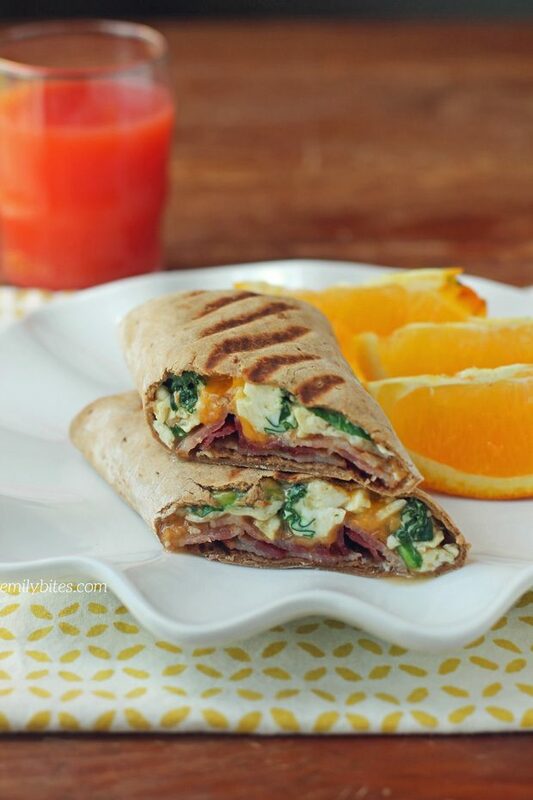 These wraps are super filling and perfect in the morning or for an easy weeknight breakfast-for-dinner! The sweet pancake syrup and the smoky, salty bacon are such a great combination of flavors, and the eggs, spinach and sharp cheddar cheese make for a super hearty breakfast. I love using the Light Original Flatout flatbreads because they taste great, they’re super versatile and not only are they 90 calories, but each one packs 9 grams of protein and 8 grams of fiber! 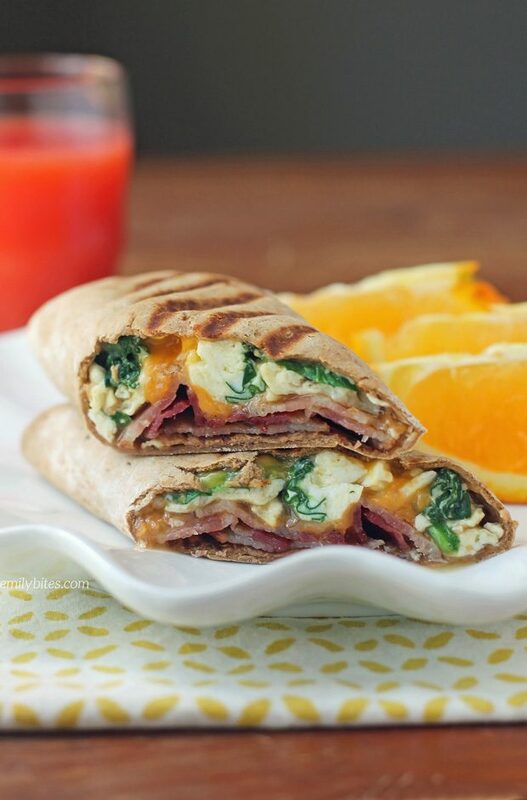 Between the flatbread, the eggs and the bacon, these Maple Bacon Breakfast Wraps have a whopping 30 grams of protein each, along with 10 grams of fiber – that’ll keep you full until lunch! Once I finished assembling my wraps I put them back in a pan because I like when wraps are “grilled,” but it’s not necessary so that step is optional. I made the recipe to serve two, but if you’re making them for the whole family it can easily be doubled or tripled! As many of you know, I love working with Flatout products. They’re tasty, healthy and so versatile. Just add your favorite fillings or toppings and you can make perfect wraps or pizzas! Plus they make wraps for whatever you’re looking for: low carb, high fiber, high protein, low cal – they have it all! Want to check out some of my other recipes using Flatouts? Check out my Black and Blue Steak Wraps, Spicy Southwest Chicken Wraps, Three Cheese Mushroom Flatbreads, Chicken Saltimbocca Sandwiches, Buffalo Chicken Pinwheel Wraps, Spinach Artichoke Flatbreads, Greek Snack Flats, Mexi Burgers with Guacamole, Chinese Chicken Wrap, Chicken Pesto Flatbreads and Bacon Cheeseburger Wraps! Cook the bacon according to package directions. Set aside to drain on paper towels. In a mixing bowl, combine the egg, egg whites and water and beat together until combined. Season with salt and pepper to taste. Mist a skillet with cooking spray and bring over medium heat. Add the fresh spinach and allow the spinach to wilt, stirring occasionally. Add the egg mixture to the pan and once you see that the bottom of the egg mixture is starting to cook, use a spatula to push the eggs and spinach around, scrambling the eggs and mixing them with the spinach. Once the eggs are cooked and fluffy, remove from heat. Fold in the rounded ends of each flatbread over the filling. Then fold one of the long edges over the filling and continue to roll until the wrap is completely rolled up. Optional: Mist a skillet or grill pan with cooking spray and mist both sides of the wraps as well. Bring to medium heat and place the wraps seam-side down in the pan. Cook for a couple minutes until the bottom starts to turn golden, then flip and cook the other side for an additional 1-2 minutes until that side is golden as well. Cut each wrap in half and serve.